MochaSoft is a really cool company. I guess their software is everywhere. I first started using their software on my Revo device. At different times, I had used there applications on different devices. Recently, I've installed three cool applications from MochaSoft. 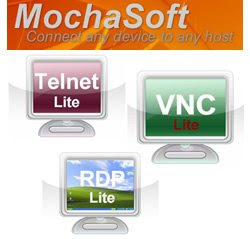 Mocha VNC Lite, Mocha Telnet Lite and Mocha Remote Desktop Lite. As expected, the applications work like charm. I connected to both a Windows XP machine and a Windows 2003 Server machine with the Mocha Remote Desktop Lite and I was really impressed with the speed and responsiveness of the application. Mocha VNC Lite worked fantastically fast when I connected to a Linux box. Finally, Mocha Telnet Lite performed on par with the other two applications. As you may guess, there are commercial counterparts of these applications. However, for most of the users the Lite versions offer everything to work comfortably. If you need the full power of the applications, then go for the commercial versions.